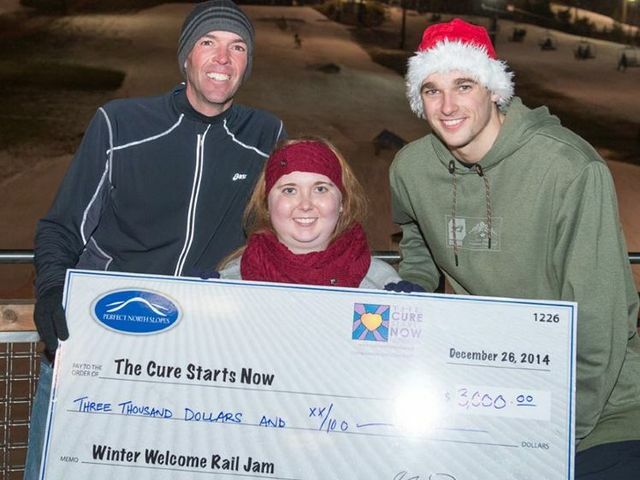 It was two great Lawrenceburg-area athletes for one great cause when Olympic skier Nick Goepper and basketball hero Lauren Hill teamed up at the annual Rail Jam Friday night at Perfect North Slopes. “We’re out here in her honor kinda spreading the love,” said Goepper. Goepper, 20, who won a bronze medal in slopestyle at Sochi last February, hosted the event, which brought together about 100 skiers and boarders. Hill, 19, watched from the deck with family members. The proceeds went to the Lauren Hill Tribute Fund at the Cure Starts Now Foundation. Hill, who has inoperable brain cancer and became a national sensation while playing basketball for Mount St. Joseph University, has raised more than $740,000 for research into her rare disease. Her story captured the eyes and hearts of thousands of Americans – including famous athletes and celebrities – who have joined her cause. Hill is trying to raise $1 million by New Year’s Day. Goepper and Hill are almost neighbors. Goepper is from Hidden Valley Lake and Hill is from Greendale. “I’m really excited for this event tonight. This is one of the highlights of my year,” said Goepper, who just came off a third-place finish in the Dew Tour Championships in Breckenridge, Colo.